I went back to liquid shampoo and conditioner this month after trying plastic free hair for a year and a half. This is the longest time I’ve tried anything because I really wanted to make it work - I even cut off 60% of my hair to make it more manageable, but in the end I have to admit shampoo bars are not right for me. I do think it will work for people with finer hair, though. My hair is thick and coarse, and the bars cling to it leaving my hair thick (which I like), but also sticky and dusty. I still travel with shampoo and conditioner bars because it's convenient, but for long term use, I need to mix in a liquid shampoo and conditioner to rinse out the shampoo bar gunk that collects. These are my recommendations for shampoo & conditioner bars if you want to give it a whirl yourself. 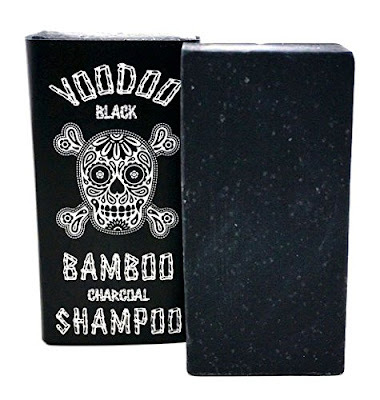 Shampoo bars - The Beauty & The Bees - Voodoo Black Bamboo from Biome was my favourite. It lathers up nicely when you rub it on your wet hair, it left my hair 'volumnessy' as someone at work described it. I chop my bars in half because I have tiny hands syndrome (it hurts my feelings that I have something in common with Donald Trump) and also makes one bar last longer. Conditioner bars - I tried diluted Apple Cider Vinegar twice a week instead of conditioner for three months, but no matter how watered down or infrequent, I found it irritated my scalp. My hair also smelled a bit gross because the vinegar smell clung to it. So I moved onto conditioner bars. Lush sell 3 conditioner bars and I’ve tried them all. Eldest niece who is somehow old enough to have a job (when did that happen?!) bought me "Jungle" for Xmas. I used the whole bar, but it didn't work wonders for my knotty shampoo bar hair, even though my hair 'smells amazing' according to another workmate. Why do so many work people comment on my hair? I tried a couple more from Lush. ‘Sugar Daddy-O’ didn’t do much to smooth my hair either though it smelled great. But ‘Big’ makes my hair nice and soft, and smooth - it’s my favourite of the Lush conditioner bars and I’m still using it now. Right now, for my liquid shampoos I am using the Organic Care range, it's owned by Nature's Organics. It contains palm oil, but to the best of their knowledge it's non-conflict (no deforestation or human & animal rights violations). If anyone has shampoo bar recommendations for coarse Asian hair, hit a girl up!